(TL;DR) TVM provides abstract interfaces which allows users to depict an algorithm and the algorithm’s implementing organization (the so-called schedule) separately. Typically, writing algorithm in high-performance schedule breaks the algorithm’s readability and modularity. Also, trying various seemingly promising schedules is time-consuming. With the help of TVM, we can try these schedules efficiently to enhance the performance. In this tutorial, we will demonstrate how to use TVM to optimize square matrix multiplication and achieve 200 times faster than baseline by simply adding 18 extra lines of code. Increase the cache hit rate of memory access. Both complex numerical computation and hot-spot memory access can be accelerated from high cache hit rate. This requires us to transform the origin memory access pattern to the pattern fits the cache policy. SIMD (Single instruction multi-data), or we call it vector processing unit. Every time, a small batch of data, rather than a single grid, will be processed. This requires us to transform the data access pattern in the loop body in uniform pattern so that the LLVM backend can lower it to SIMD. Actually, all the methodologies used in this tutorial is a subset of tricks mentioned in this repo. Some of them have been applied by TVM abstraction automatically, but some of them cannot be simply applied due to TVM constraints. All the experiment results mentioned below, are executed on 2015’s 15’ MacBook equipped with Intel i7-4770HQ CPU. The cache line size should be 64 bytes for all the x86 CPUs. In this tutorial, we will demo how to use TVM to optimize matrix multiplication. Before actually demonstrating, we first define these variables. Then we write a baseline implementation, the simplest way to write a matrix multiplication in TVM. # You are free to try out different shapes, sometimes TVM optimization outperforms numpy with MKL. In TVM, we can always inspect lower level IR to debug or optimize our schedule. Here is the generated IR using our baseline schedule. # we can see big speedup compared with the baseline. Here is the generated IR after blocking. Another important trick is vectorization. When the memory access pattern is uniform, the compiler can detect this pattern and pass the continuous memory to vector processor. In TVM, we can use vectorize interface to hint the compiler this pattern, so that we can accelerate it vastly. In this tutorial, we chose to vectorize the inner loop row data since it is cache friendly. Here is the generated IR after vectorization. If we look at the above IR, we can see the inner loop row data is vectorized and B is transformed into PackedB. The traversal of PackedB is sequential now. So we will look at the access pattern of A. In current schedule, A is accessed column by column which is not cache friendly. If we change the nested loop order of ki and inner axes xi, the access pattern for A matrix is more cache friendly. Here is the generated IR after loop permutation. Another important trick is array packing. 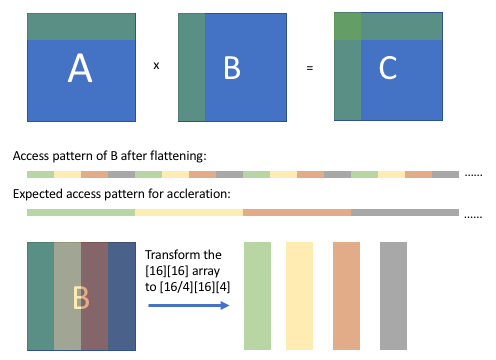 This trick is to reorder the storage dimension of the array to convert the continuous access pattern on certain dimension to a sequential pattern after flattening. Just as it is shown in the figure above, after blocking the computations, we can observe the array access pattern of B (after flattening), which is regular but discontinuous. We expect that after some transformation we can get continuous access pattern. We can reorder a  array to a [16/4] array, so that the access pattern of B will be sequential when grabing the corresponding value from the packed array. # We have to re-write the algorithm slightly. Here is the generated IR after array packing. // attr [packedB] storage_scope = "global"
After blocking, the program will write result to C block by block, the access pattern is not sequential. So we can use a sequential cache array to hold the block results and write to C when all the block results are ready. // attr [C.global] storage_scope = "global"
Futhermore, we can also utilize multi-core processors to do the thread-level parallelization. Here is the generated IR after parallelization. After applying the above simple optimizations with only 18 lines of code, our generated code can achieve 60% of the numpy performance with MKL. Note that the outputs on the web page reflect the running times on a non-exclusive Docker container, thereby they are unreliable. It is highly encouraged to run the tutorial by yourself to observe the performance gain acheived by TVM.